HydroNET is a web based portal with access to radar data in real time. Thereby radar data are directly visual such as pictures or time series. Data can also be downloaded. In combination with SCOUT, HydroNET-SCOUT is an excellent connection between two supplementary software products: SCOUT is processing and correcting radar data and calculates adjusted radar data. HydroNET is displaying data on a safe website and makes it possible to investigate events. 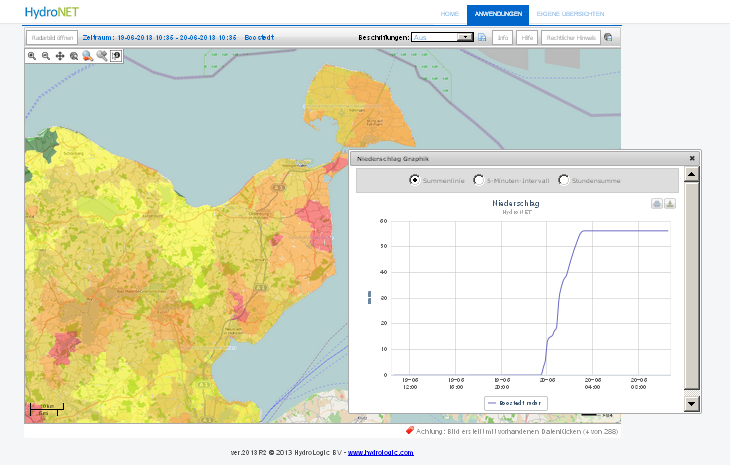 HydroNET-SCOUT is in use for the land Schleswig-Holstein at the LLUR (Landesamt für Landwirtschaft, Umwelt und ländliche Räume) and is delivering its data to the emergency services of the city of Luebeck (RainAhead). 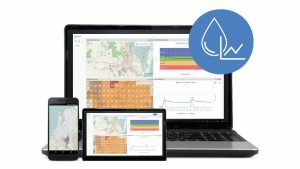 The event data base of 4 water boards in Nordrhein-Westfalen are also based on HydroNET-SCOUT. Here you can find rainfall data over the last 16 years over an area of 32000km² displayed on a one kilometer grid, with a time step of 5 min. Since May 2017 hydro & meteo is the distribution partner of HydroNET in Germany.